Welcome back to the fortnightly Haiku Challenge! 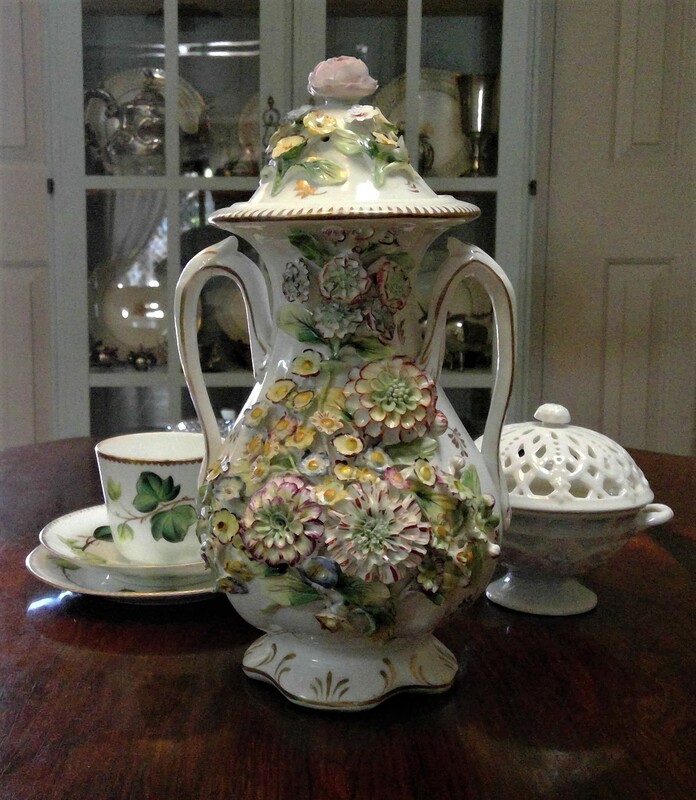 About the object: This is an English soft paste porcelain potpourri vase from the Coalport factory, made around 1820-30. The flowers were apparently made in Germany and could be ordered by English manufacturers to decorate their own wares. As a collaboration it is wonderful to imagine little boxes of delicate flowers travelling around Europe just to create such “fripperies”. Each petal is hand painted and the entire piece is hand thrown. It may be “over the top” but I love the amount of work gone into making it and the amount of history embedded in it. How it ended up in a dusty corner in an antique store in Perth for an absolute song I have no idea. It is probably one of the most well-travelled vases in history. The fact that most of the flowers are undamaged is quite astonishing. This is a Haiku Hub event! Is love a tornado for Playing with Words? The very world is in flux from the pen of The Syllabub Sea – lovely presentation of the poem in picture form too! Want to join in? Just leave a link to your haiku post in the comments and I will include it in the summary for the next prompt. You can use the photo or the prompt words as your inspiration and you are more than welcome to use the photo if you wish in your own prompt. All the images are my own so feel free to enjoy them. 🙂 If you include “TJ’s Household Haiku” in your tags it makes it easy for others to find your haiku. Best wishes for a fortnight of poesy! A Simple one from me today! Not in the mood to create a decent haiku today, I think that ostentatious vase with its screaming colors just made my headache return. Oh dear! It is rather garish I agree. I absolutely adore this setting.